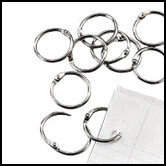 Metal loose leaf binding rings are used to bind paper, swatches and to create many displays. 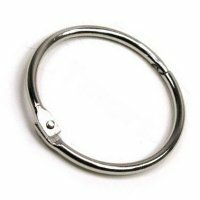 As a direct importer and distributor of Binding Rings we are your direct source for all your binding ring needs. 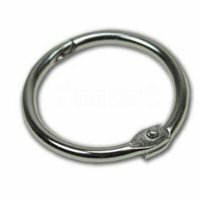 Our black plastic snap rings have an easy to use one piece snap closure design. 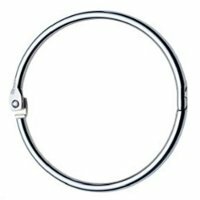 Simply press closed for hanging of signs from wire or monofilament or to make light weight sample swatches. There are 100 rings per package. 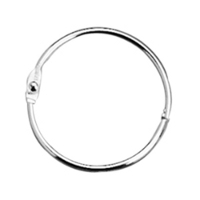 Our white plastic snap rings have an easy to use one piece snap closure design. Simply press them closed to hang signs from wire or monofilament or to make light weight sample swatches. There are 100 rings per package. 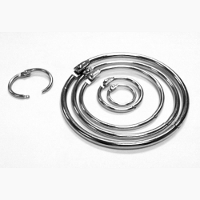 Our clear plastic snap rings have an easy to use one piece snap closure design. Simply press them closed to hang signs from wire or monofilament or to make light weight sample swatches. There are 100 rings per package.